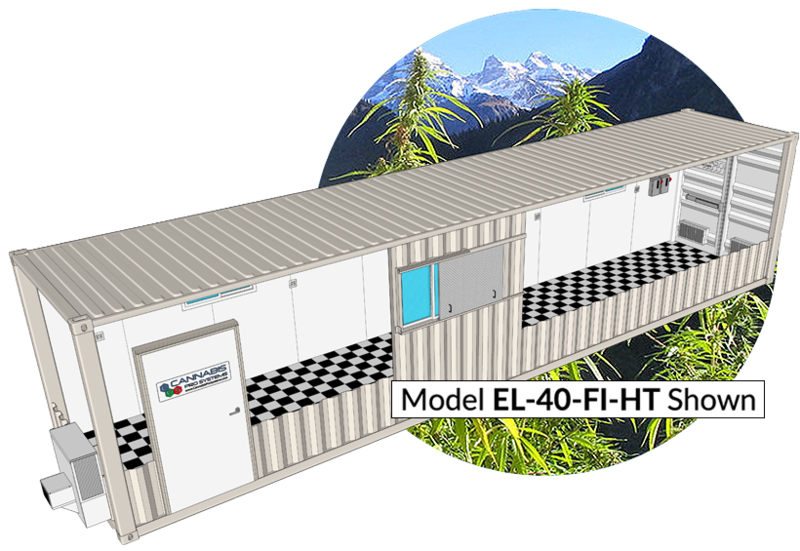 All of our extraction labs are based on high-cube, ISO shipping containers and are completely modular and customizable. Any workflow layout arrangement is possible: Side by side, end to end, end to side, stacked… any combination required to realize your unique and innovative vision. Our labs can be outfitted for CO2, Butane (BHO), Propane, hazardous or other specialized non-standard extraction methods. We offer options and upgrades that allow an unlimited array of custom configurations. Engineered from top to bottom with a focus on safety and security. Our extraction labs come standard with a fully finished gloss white interior or optional “Clean Room” R13 insulated wall panels. The result is a worry free, turnkey, full scale production environment, made to order. Built to be versatile and modular, our Working Labs can be what ever you need it to be, just the way you need it. You might need a space that requires tight control over temperature, humidity, air circulation… No problem, it’s a sealed secure environment. Maybe you just need a clean, secure, portable office. Our Working Labs are meant to become the work space you need. It’s a plant. Just water it and wait, right? Nope. There are around 800 different strains of cannabis, with more being cross-bread all the time. Cannabis has over 480 natural components, and can produce at least 85 distinct cannabinoids, each with it’s own unique effects on the mind and body. Whether medicinal or recreational, getting the exact results you expect with predictable consistency requires that you MUST have full control over every aspect of the grow environment. We want to help you get started! Click here to request a quote. ©2017 MFS, Inc. Site Designed and Built by the Marathon Design Team. Any seasoned grower knows that a light and air trap is a luxury worth having! If red or blue light gets into your controlled grow environment during the critical ‘Flower Inducing’ dark cycle and the plants are likely to revert to the vegetative state. Another bothersome issue is the heat generated by necessary components (like ballasts), and can really mess with your temperature envelope, even your humidity. If you are looking to optimize environmental conditions, a control room (vestibule) can really make a difference! With a control room, you can work in the light while your buds happily flower in total darkness and keep some of the excess heat out of the grow zone. There are other benefits of a control room, especially if your using supplemental CO2. You need a tightly controlled environment, so get the highest level of control possible. Give yourself an unfair advantage! The control room is created with a wall to wall, ceiling to floor divider with a light-tight entry door. 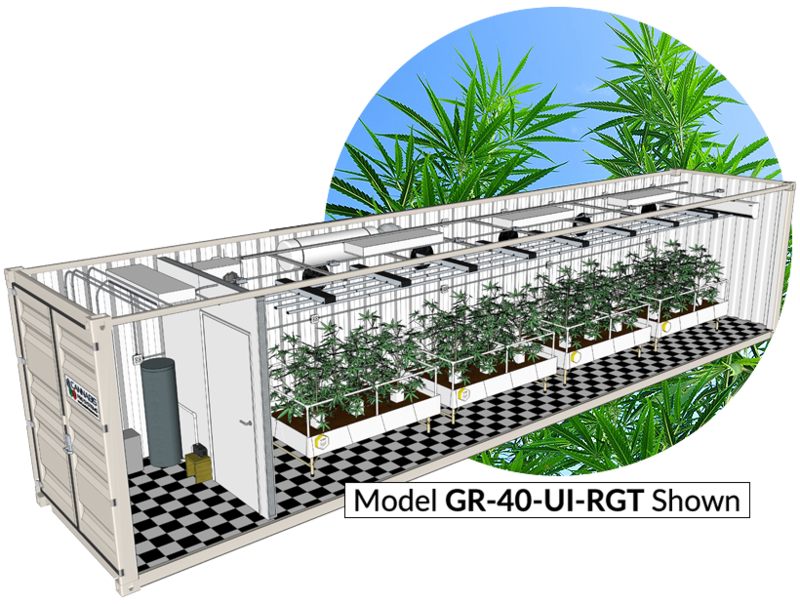 This divider can be built anywhere along the length of the Grow Pod, so you can have a 6 foot control room or a ten foot control room. You tell us what you need. It’s that easy to take full control of your Grow Pod. We outfit our grow pods with an abundance of working light, for those times between grows when you have to clean up, perform maintenance, or if you are using this room for office or work space. Create Supplemental CO2 “on the fly” when you need it! No waiting for a CO2 tank delivery, or having to spend time changing tanks, the NG CGNG-8 “8 Burner” CO2 Generator features eight pre-installed brass burners that generate 21.6 cubic feet per hour of CO2 using natural gas. If you plan on using supplemental CO2 to BOOST the yield in your grow rooms, this is the way to go! This model includes plugs to reduce the number of active burners, making it easy to reduce the CO2 and heat output to suit a smaller growing space. Electronic ignition and dual solenoid valves, which eliminate the open pilot flame and provide safe, reliable starts. A safety tip-over switch automatically stops gas supply to the burners if the unit is not upright. This unit includes a gas regulator, 12-foot hose, and hanging hardware. 15 inches by 9.8 inches by 18 inches. We wire all our Grow Pods to your specifications, based on total amp load requirements. Your system will provide more than enough power to keep your grow lights burning. We provide multiple vectors and levels of security features, including a Trilogy T2 DL2700 digital commercial keyless door latch and a video surveillance ‘RING’ door bell. Options and upgrades include windows with locking ‘Hurricane’ steel covers, internal security gates to sequester and secure inventory, and more. If you have a 3rd party security solution you prefer, we will incorporate that into our pod build. • Polyisocyanurate foam core is moisture-resistant and very thermally efficient. • Fiberglass reinforced plastic (FRP) holds up to regular cleaning and sanitization procedures. We use only high quality Armstrong® linoleum flooring, famous for it’s tough and long lasting surface properties. Made for constant use and heavy foot traffic, this long lasting finish is easy to clean, which will help reduce the possibility of contamination or mold. You can choose from a wide selection of patterns (we are partial to the ‘Classic Checker’ pattern. You may have noticed…) and finish types. The Quest Dual 205 is our highest capacity 115 volt dehumidifier for indoor grow rooms. Using 13.2 amps, the Dual 205 removes 205 pints of water per day. The Dual 205 does all that while running 46% more efficient than Energy Star standards. The Dual 205 is made in the USA using the very best components and materials available. Engineered to be so rugged that every one of our dehumidifiers comes with a 5 year warranty. Dehumidifier capacities are at the standard American rating condition of 80ºF and 60% RH. Keep that nosy neighbor from smelling your buds! This ventilation fan can easily recycle the entire volume of the grow pod’s atmosphere in under 3 minutes, and the carbon filter will remove the tell-tale smell that you might be worried about. Worry no more! This problem is handled. The Super 8 Digital Oscillating Wall Mount Fan produces a figure 8 pattern for better and more uniform air circulation. Program precise fan movement patterns to fit any application. Includes speed control, 6 hour increment timer and oscillation controls. Our new memory function will allow these fans to work on timers as well as power back up to its previous setting after power outages. This fan has reliable metal gear construction which makes for whisper quiet operation. Remote control makes for easy operation. The included remote for your Super 8 Wall Mount Fan can control all of your fans in the Super 8 family, including Super 8 Stand Fans. So whether you have 1 fan or 50, one remote can control them all! Lighting is THE key component of a successful grow operation. You can “fudge” many of the important grow parameters to some degree and still get a good yield… not the lights. Full Spectrum L.E.D.s are arguably the most exciting technological advancement in grow lighting for decades, possibly EVER! Full spectrum means just that: Lighting that contains everything your crop needs to grow full and fast. FSLEDs last considerably longer, generate much less heat, use much less energy… virtually better in every way when compared to other grow lighting solutions. This lighting solution is specially designed for close-proximity, controlled environment agriculture and multi-tier vertical farming environments. An average — not max — photosynthetic photon flux density (PPFD) above 900 makes this the perfect choice for high-DLI crops from veg to bloom when paired with a 0-10V dimmer or an adjustable height Uni-Track mounting system for optimized PPFD. Current lead time projection is 2 weeks from payment received. We are experiencing high volume and ramping our manufacturing as quickly as possible without sacrificing quality. Recommended mounting height 6” from top of canopy for optimal light uniformity, penetration and flux density above a 4’x4’ canopy. Suitable for operation in still air ambient temperatures from -40°F to 95°F when suspended and up to 86°F when surface mounted. Operating temperature ranges between 77°F to 86°F above ambient. We recommend at least one ft3/S of airflow to ensure efficient cooling. Proper air flow will also increase the maximum suitable operating temperature and help extend lifetime of system. Amperage depends on fixture wattage (660W for SPYDRx PLUS) and input voltage. Below is a general estimate, your actual results may vary. This lighting system is guaranteed against manufacturing defects for three years with projected lifetime of 100,000 operating hours to 70 percent of initial flux. Lighting is THE key component of a successful grow operation. You can “fudge” many of the important grow parameters to some degree and still get a good yield… not the light. If you get this wrong, you will fail. Known as the’GROW BEAST’, it combines Metal Halide & High Pressure Sodium. Growers typically use both, but as two completely separate fixtures. This approach is considered by most seasoned growers to be the ‘Gold Standard’ of grow lighting. This unique product is a solution that allows the use of both bulb types in a single fixture. Metal Halide is a ‘BLUE’ light, whereas HPS is a more ‘RED’ light. Cannabis requires both, but at different times during the grow cycle. By combining these two time-tested and capable light sources, you get the right light to encourage aggressive growth and a superior yield. Welcome to the Networked Grow Room! We provide a real-time remote-access solution for your grow room that can be monitored and controlled right from the palm of your hand! Simply configure your environmental set points and the system controller’s “smart logic” process detects problems, sends alerts, and automatically takes corrective steps to prevent and resolve critical grow room events! This is the perfect automation solution as you begin to build your networked grow room. Utilizing an industrial-grade wireless communication protocol, The Hive™ Gateway is your central hub for processing the incoming environmental data from your LTH Pro Sensor, as well as the operating status of appliances plugged into your Stinger Smart Power Strip 4 or our new 24v Dry Contact Controller. With your existing WiFi signal, you can then monitor and control your garden, set up alerts for when conditions go outside their set points, and initiate corrective actions for optimal conditions…all this across multiple garden areas and all from your web-enabled smartphone, tablet, or computer! This is the way to grow your business! Easy to set up, this environmental control system helps deliver higher quality results and a more consistent yield. This is a fully scalable system that grows with your operation. We offer a wide array of add-on sensors and controllers including additional LTH & LTH PRO sensors, water content sensors, and programmable power plugs. Our environmental control system provides a complete solution for all of your lighting, irrigation, nutritional, and environmental requirements to create your perfect grow room environment. Made FOR growers BY growers, this system delivers your unique experience with digital efficiency through a simple and easy to use phone application. No matter where you are, you can be there. Wireless data transmission for “Real-Time” environmental readings of Temperature, Humidity, VPD, CO2. With an optional Apogee PAR sensor, PAR, PPFD (Photosynthetic Photon Flux Density) and DLI (Daily Light Integral). 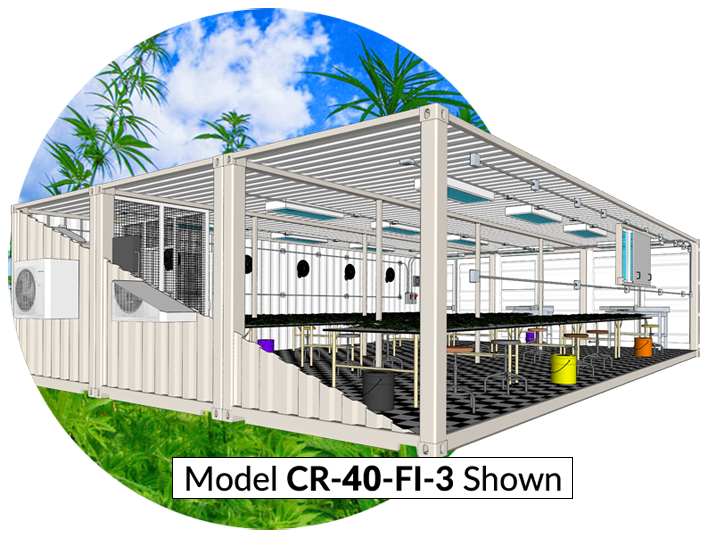 Easily installs into any existing grow room configuration. Utilizes industrial-grade, machine-to-machine wireless mesh network technology (IEEE 802.15.4). Integrates with multiple LTH or LTH PRO sensors for individual and aggregate sensor data logging. Eight relay dry contact controller is ideal for opening low-voltage solenoids serving multi-zoned irrigation systems within a single micro-climate. All SmartBee products come with a one year warranty against defects in materials and workmanship, subject to certain terms and conditions. SmartBee will replace your defective gear at no cost to you. In addition, warranty coverage is also provided for the second year of ownership. During the second year, SmartBee will replace your defective gear after payment of a modest deductible. Replacement units are sent FedEx ground at SmartBee’s cost and are typically delivered in five days or less. Based on a 40 foot long single unit (roughly 1,000 square feet), we keep things cool with a 28,500 BTU Ductless Split Air Conditioner, warm with a heat pump rated at 19,800 BTU, and this unit has the added benefit of dehumidifying at the rate of about 3.8 pints per hour (PPH). This unit has a SEER rating of 18 and ETL and cETL safety certifications.